Preheat oven to 200°C . In a medium bowl, whisk together flour, sugar, salt and cinnamon powder. Cut butter into a few chunks and rub it into the flour mixture with your fingertips. Mix milk and vanilla in a small glass. Pour about 4 tablespoons into the flour mixture and stir until the mixture starts to come together. Add the banana chunks and chocolate chips. Continue to stir, adding more milk if necessary, just until dough comes together. Do not over mix. Pat dough into a disk about 1inch thick. Cut using a cookie cutter and place each piece on baking sheet. Brush the top with some milk (optional). Bake for 17-20 minutes, until light gold. Cool on wire rack or eat warm. I found this recipe in the Net and it took me a year before I finally made up my mind to try it out. I love it even though I’m not actually a fan of pineapple tarts …. my hubby, youngest daughter and even my eldest daughter’s friend (who slept over last night) loved it! In fact, the friend asked if she could order from me and I told her if the mood strikes again, when I baked the tarts next time I would give a tub away to her …. told her no need to order cos I don’t take orders. Since this was my first attempt at making this lotus-shaped tarts, I have to say that I need lots of practice to perfect it. The visual did not look as good but one thing I was satisfied was the taste. The tarts really taste good. This recipe is indeed a keeper! Combine and mix thoroughly ingredients A using a spoon. Add the plain flour and .mix thoroughly till it becomes a soft dough. Roll dough placed in between a plastic sheet to 1/4 inch thickness. Use a floured 5 or 6 petal flower shaped cookie cutter and cut dough. Gently press the center of flower-shaped pastry with finger and place the pineapple filling on it. Using a small scissor, snip the edge of petals and lift it up onto the filling. Place on a baking tray and bake in preheated oven at 150 degree C for about 30 mins. Rotate the tray halfway through the baking. Cool tarts and its ready for storage. I woke up early today and decided to bake the Sugee Cake and bring it to my sister’s abode later in the afternoon. 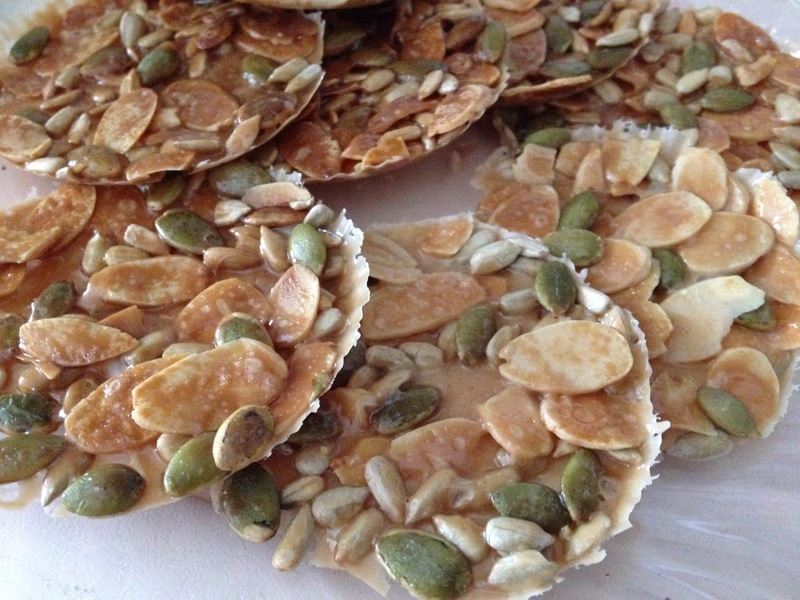 This recipe was shared by a fellow blogger, click here to view the original post on the recipe. – Sift flour and baking powder into a bowl and stir in semolina, minced almond and salt. Mix well. – Beat eggs, milk and vanilla essence together in a bowl. – Cream butter, sugar and honey till light and fluffy. Gradually add in the egg mixture, beating constantly. Mix in flour mixture at low speed and stir till well combined. – Spoon the batter into an 8-inch cake tray lined with baking paper. – Bake for 45 minutes at 150 deg C or until an inserted cake tester comes out clean. Cool cake for 15 minutes, then remove it from the mould and leave to cool completely on a wire rack. Last night after I came back home from attending a talk, I found myself surrounded by lots of leaves (herbs) and other food stuffs ….. all these given by a cousin of my husband as well as some from my mil. Among the food stuffs, there were 2 bags full of oranges. I think if its not because of the oranges I would not have try the recipe today. So today, I decided to google for an orange chiffon cake … the idea to do so triggered by a colleague of mine. She had been telling us how good her orange chiffon cake was and since I hesitated to try hers (cos she’s non-muslim and the utensils she uses are most likely not halal-permitted) I decided to try baking on my own. I decided to try it out cos it seemed to be the easiest and from the picture it looks easy as well. I doubled the portions for the cake and was able to get two cakes. The first portion was eaten up quickly enough within 15 mins after it cooled. The second portion will be for tea-break later. Sift the cake flour, baking powder and salt together and combine well. Set aside. In a large mixing bowl, whisk the egg yolks and sugar. Stir in the oil, orange juice and orange zest. Add the flour mixture in 3 batches. Use a large clean mixing bowl, without any trace of oil or water, beat the egg whites with an electric mixer until bubbles form. Add the cream of tartar and mix well. Add the sugar in 3 batches, about one-third at a time, and beat well between additions. Continue to beat until stiff peaks form. With a spatula, fold-in the beaten egg whites into the batter in 3 batches. Pour the mixture into the cake pan and bake in the preheated oven for 15 mins. Reduce heat to 160 degree C.
Continue to bake for 20 to 25 mins, or until cooked through. A needle comes out clean when inserted in the middle. Note: Do not greased the baking tin. 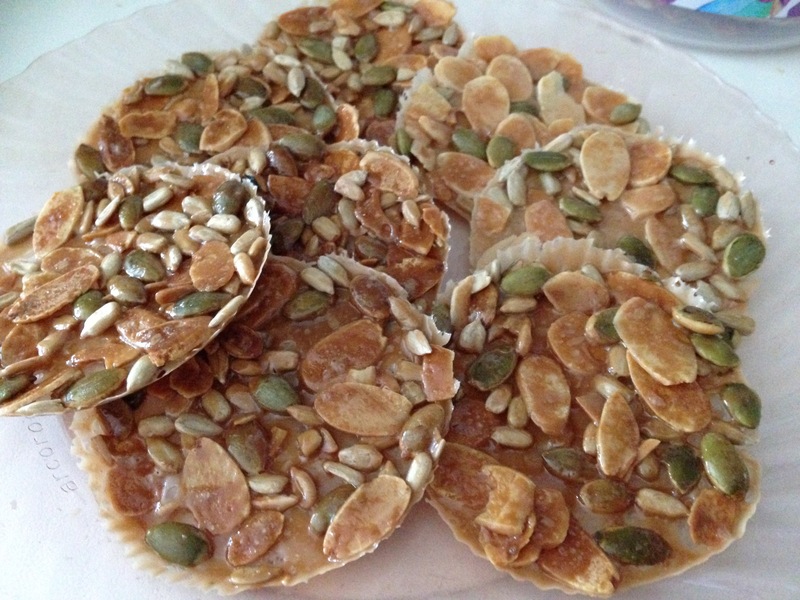 I promised my husband that I will baked his favourite Oats Cookies after raya …. 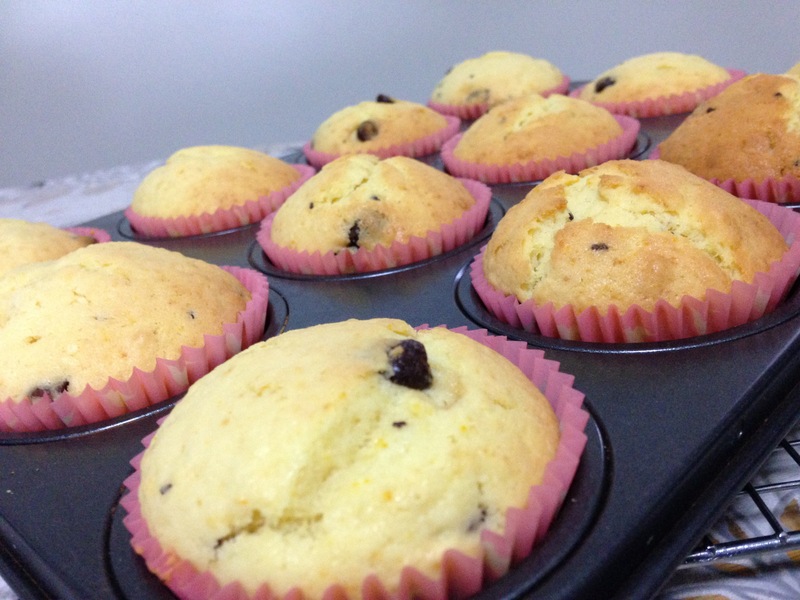 and since today is a public holiday, I decided to bake them to surprise him when he comes back from work later in the evening. Here’s the recipe for the Oats Cookies. Instead of adding diced red cherries on top, I substitute it with choc chips. 1. In a big bowl, mix thoroughly the butter, sugar, egg and vanilla essence. Use a spatula to mix them. 2. Add in the oats and almonds. Mix well. 3. Use your hand to take a bit of the mixture and clump it together into a small round shape. 4. 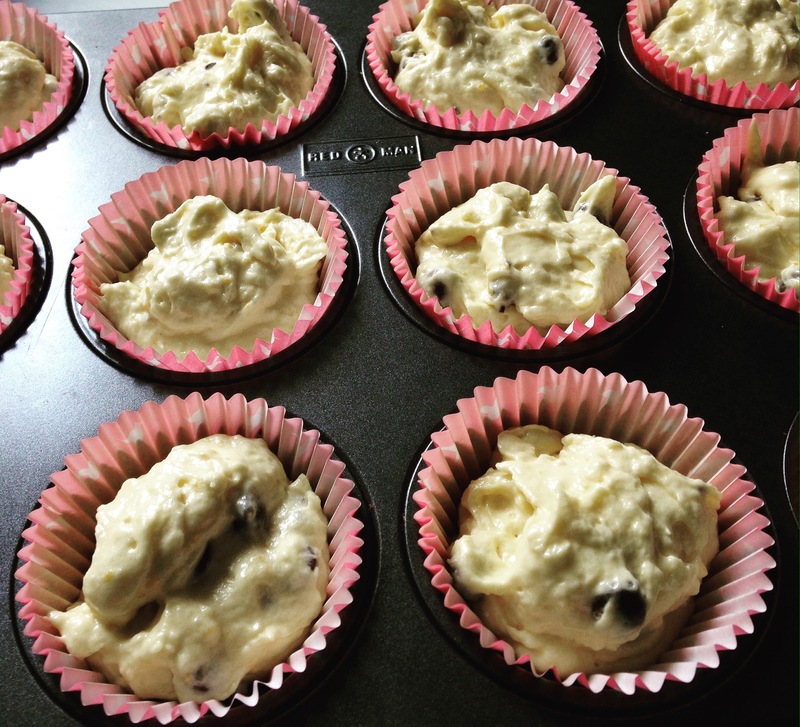 Arrange onto the baking tray and add either small cut red cherries or chocolate chips on top of the cookies. 5. Baked at 180 degree C for about 15-20 minutes or till golden brown. 6. Cool the cookies and keep them in airtight cookie bottle. 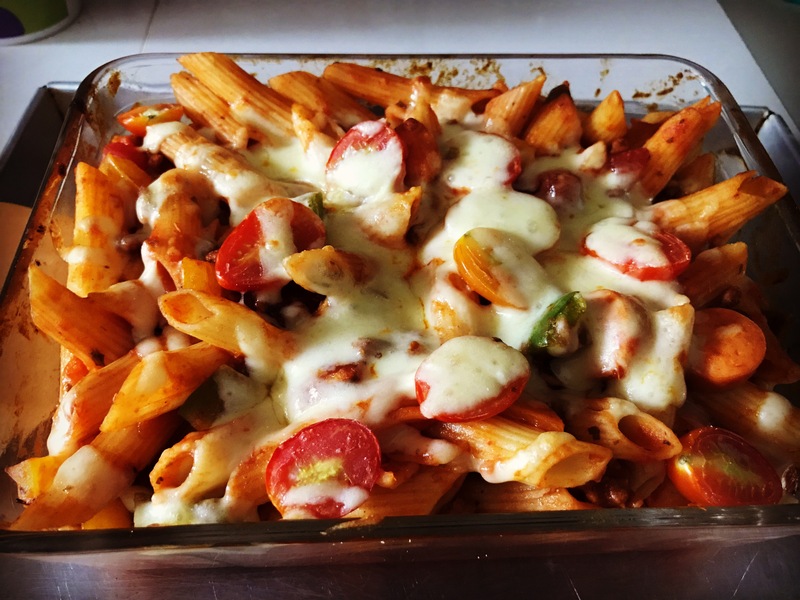 With the young guests coming over to the house last Sunday, I decided to cook baked pasta and I chose the pasta “penne” instead of the usual “elbow”. 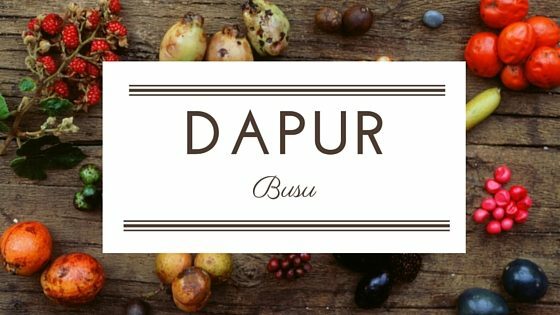 Then yesterday night, my daughter told me that her all friends had requested for the recipe. So I decided to type it out here so that they can refer anytime they like. 1 pkt of penne – boil with water (sprinkle with a bit of oil), once soften, drain and wash over with cold water. Drain well and put aside. In a medium size pot, heat up and add a bit of oil to fry the garlic and onion. 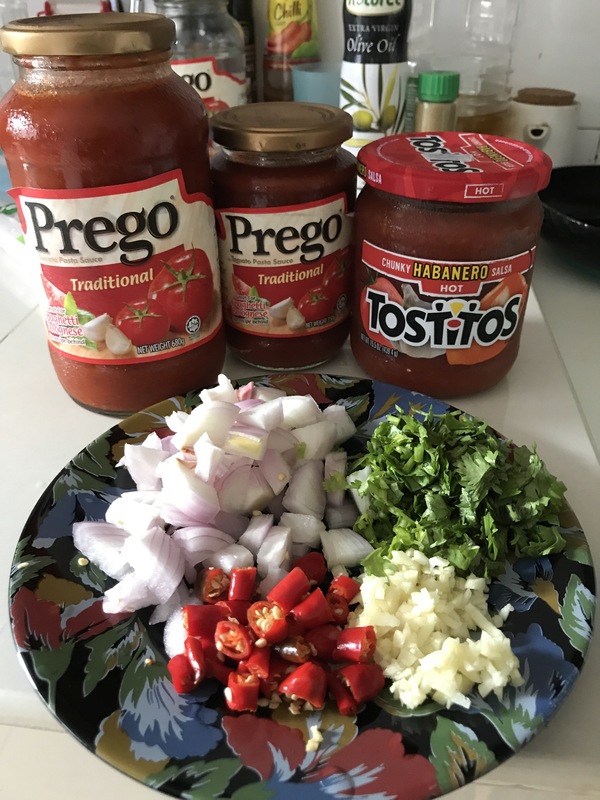 Once the garlic and onion has soften (about 3-5 mins of frying), add the spaghetti sauce and Tostitos sauce. Add about 1-2 cup of water or more depending on how thick you want the sauce to be. Stir and then add the minced meat. Let it simmer for about 5 mins. Then add in the chilies and coriander leaves, the mixed spiced, sugar and salt to taste. If you like to add the black pepper powder, you may do so as well. Stir well. Last, add in the sausages and let the sauce simmer for another 10 mins before you off the fire. .
Have a baking tin or bakingware ready. Spray a bit of olive oil (optional), add the pasta, the capsicums and the sauce. Mix well. On top add the cherry tomatoes and then sprinkle the cheese. Bake in the oven for about 10-12 mins at 180 degree celsius. The recipe itself is easy to do but the only thing I would grouch is the price of the florentine flour. It is not cheap …. for a 500g packet, it cost about $11. No wonder seller are selling it by grams. Anyway, since CNY is coming up soon, I had decided to bake this cookies for my department colleagues. I think I will also do this for the coming Eid celebration in June. Its cheaper to do on my own than buying from outside since it cost more to buy. 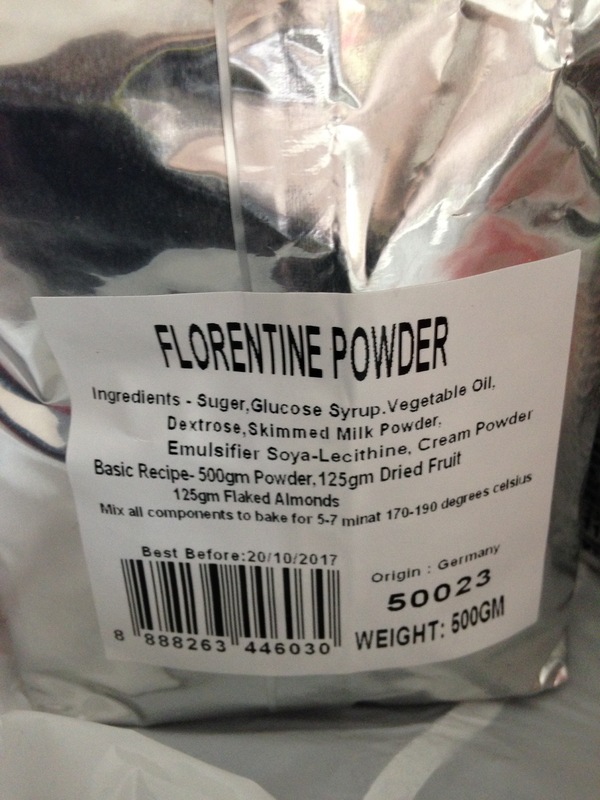 Here’s the recipe for the Florentine Cookies. Note: I prefer to use ths method cos its easier to peel off the cookies and it looks nice in round shape, but you could do it other ways, just google the internet and you can see other methods. – Bake the nuts separately in the oven for about 4 mins at 150 degree C.
– Pour the florentine flour into a big bowl and add the pinch of salt. Mix thorougly. 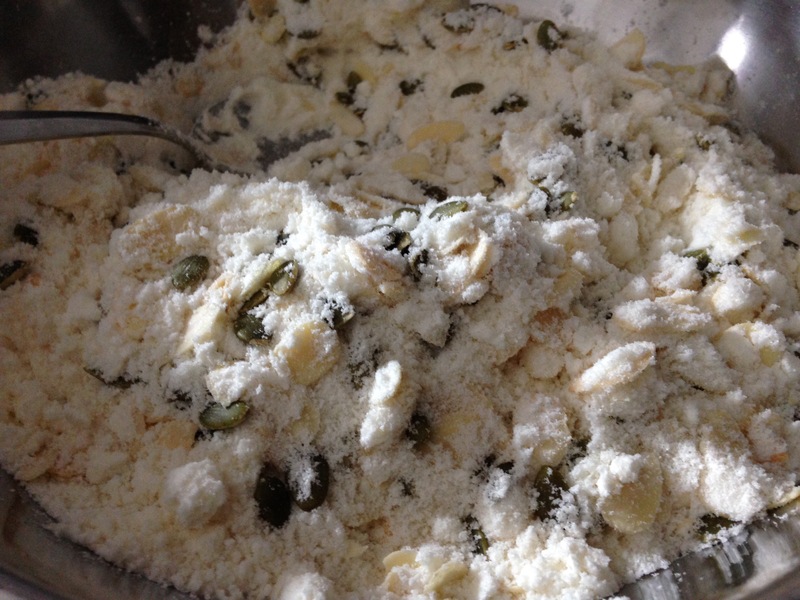 – After the nuts are cool, add them to the flour and mix well. 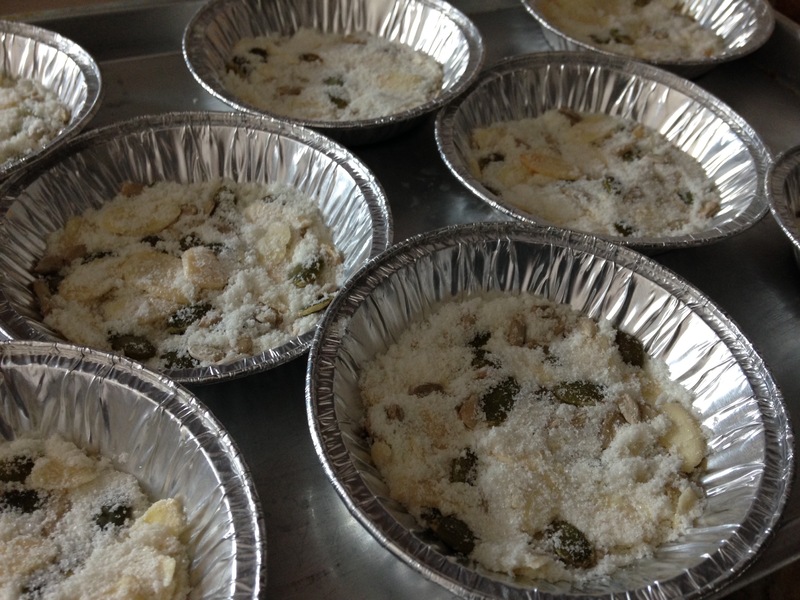 – Up the oven temperature to 160 degree C.
– Scoop a spoonful of the mixture into the aluminium mould, spread them firmly and place the moulds into the baking tray. – Take off from the oven and let it cool for about 2-3 mins before pushing it out from the moulds. 1. You have to be vigilant while making these cookies as they cook very fast. 2. To peel from the mould, just turn the mould upside down onto your palm and using your other hand, press the back based of the mould. Cool the cookes and keep them in an airtight container.